New England is compact, but to drive from the Connecticut shoreline to northern Maine (550 miles/885 km, 9+ hours) would be a long day. Never mind. You won't be spending long days driving. Usually, you'll drive only an hour or two from one destination to the next. Suffice it to say that you can see a lot of New England in a week's travel. Ten days is better, of course, and two weeks gives you time to go into some depth of the cultural offerings of Boston or the Berkshires, spend some time hiking and camping in the White Mountains, spend a few days sailing the Maine coast in a windjammer, or get into serious beach mode on Cape Cod. If you'd rather have someone else do the planning, logistics and reservations for you, take a guided tour. Many tour companies operate guided tours that include New England, often along with New York City, Philadelphia and Washington DC. 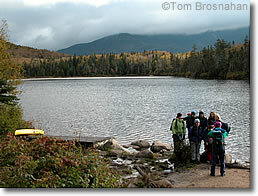 The most popular tours are, of course fall foliage tours. Every major tour operator seems to have at least one. 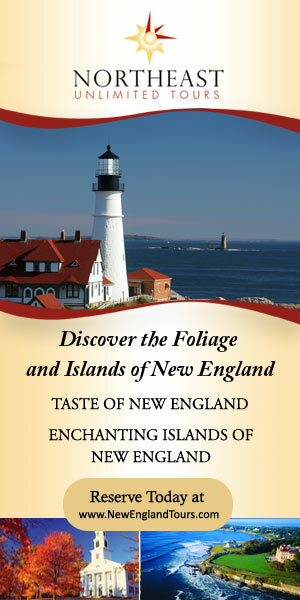 Here's a list of companies providing guided tours of New England. Hiking group in the White Mountains.